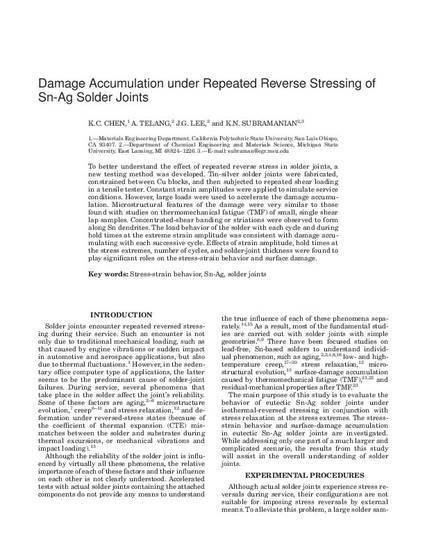 To better understand the effect of repeated reverse stress in solder joints, a new testing method was developed. Tin-silver solder joints were fabricated, constrained between Cu blocks, and then subjected to repeated shear loading in a tensile tester. Constant strain amplitudes were applied to simulate service conditions. However, large loads were used to accelerate the damage accumulation. Microstructural features of the damage were very similar to those found with studies on thermomechanical fatigue (TMF) of small, single shear lap samples. Concentrated-shear banding or striations were observed to form along Sn dendrites. The load behavior of the solder with each cycle and during hold times at the extreme strain amplitude was consistent with damage accumulating with each successive cycle. Effects of strain amplitude, hold times at the stress extremes, number of cycles, and solder-joint thickness were found to play significant roles on the stress-strain behavior and surface damage. The original version can be found at http://www.springerlink.com.